When Westminster City Council took on the free newspapers London Lite and The London Paper, Londonist was fully supportive. Tired of the masses of papers scattered around the city at the end of each day, the Council asked that Associated Newspapers (owners of London Lite) and Rupert Murdoch's News International (owners of The London Paper) take responsibility for the amount of rubbish they were creating and install 150 newspaper recycling bins around Westminster and arrange for recycling collection. The Council didn't get quite what they were hoping for, but the two papers have agreed to a scheme that will see them place 40 bins in four key areas – Oxford Circus, Charing Cross and Embankment, Leicester Square and Charing Cross Road and Victoria station. This should help with reducing the rubbish created by the almost 1 million papers handed out on the street each day. Currently, there are 20 tonnes of newspapers thrown away each week. That's roughly the equivalent of 17 Mini Coopers each week, or 884 cars each year. That's an awful lot of rubbish. Of course, it's not as simple as just installing the recycling bins. 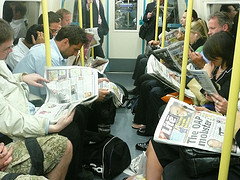 Ultimately it's down to the commuters reading the papers to decide whether they recycle them or leave them scattered on bus and tube seats. We applaud the Council's effort though, and hope that the scheme is successfull and spreads across London. The scheme will be in place before the end of the year for a three month trial, and we hope it goes well.